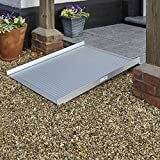 This Folding Suitcase Ramp is ideal for providing access to houses and cars for wheelchairs, scooters, walkers and rollators. 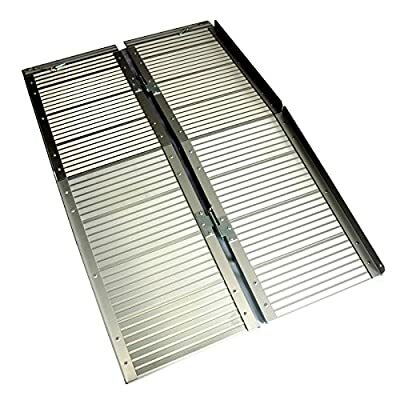 The ramp is supplied in two parts that can be easily slotted together and secured with the supplied pin. Constructed from sturdy, rust-free aluminium with strong carrying handles attached, making the unit portable and convenient to store. 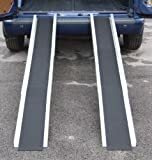 This versatile ramp has a hole and security pin on its upper end to secure the ramps to a step or back of a vehicle. You may need to drill a hole on your step etc to secure it. This same pin can also be used with another hole to hold them closed when folded for storage or transport. Maximum load of 270 kg (42 stone) when using both ramps joined together. Folded Length of each part - 63cm / 24.8"
Folded Width of each part - 36cm /14"
Folded Depth of each part - 13cm /5"
Width Assembled - 74cm / 29.5"
Depth Assembled - 8cm / 3.1"
Internal width of track - 66cm /26"
Folded Length of each part - 92cm / 36"
Suitable for wheelchairs and most mobility scooters. 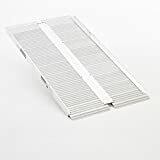 The Folding Suitcase Ramp is available in 2 lengths. 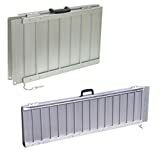 Box contains 2 single ramps which both unfold and when secured together form 1 large ramp. 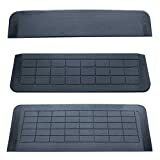 Easy to use, store and transport. 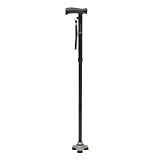 Silver built in grip finish for safe all-weather use. Carry handles so both parts of the ramp can be folded and carried "suitcase style" Please check all the measurements of the ramp and the place it is going to be used before purchasing to check it will fit. Please also check that the length of ramp you order will not be too steep for the intended use.